Cervejaria Sudbrack Ltda. - Eisenbahn S.A.P.A. A South American beer brewed in strict accordance with the German Reinheitsgebot of 1516? It would seem so, but this sucker tastes more Belgian than German. S.A.P.A. stands for South American Pale Ale, which is an interesting title considering the fact that this is actually a Belgian-style Pale Ale. The word Eisenbahn is German for railroad, and the original Brazilian labels for the Eisenbahn beers depict classic train engine cars. The new U.S. labels embody the South American spirit, capturing an animated train car cutting through a vibrantly colored landscape of dense forest as it trailblazes its way out of South American (en route to the US beer market no doubt). If you’re expecting a classic Pale Ale, you’re in for a shock. We didn’t know what to expect when we popped these babies open for review. Here’s an excerpt from one of our beer panel reviewer’s notes: “Absolutely unexpected Belgian yeastiness strikes me instantly. This pale ale smells like a witbier or fruity hefeweizen with its big bubblegum notes and notes of candied banana bread. A major departure from the US Pale Ale, and distinctly Belgian.” Expect Belgian yeast flavors (banana, cloves) as well as a real horsiness, similar to a farmhouse ale (also known as “Saison”). The finish is a mix of sweetness, cereal graininess, smokiness and yeastiness. We found that this dark lager paired well alongside a meal of fried mushrooms and lightly spiced, roasted chicken. The microbrew renaissance of the 1980s and early 90s has swept throughout this great nation of ours. 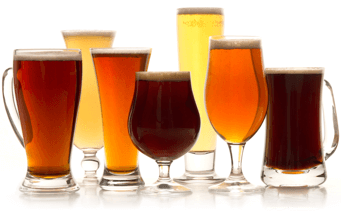 Domestically, Americans now have literally thousands of choices—and that’s just Pale Ales alone! Not since pre-prohibition days has a similar degree of diversity been available. For true lovers of real beer, life, as they say, is good. The craft brewer spirit has spread outward from the US as well—which is not to say we started it; craft brewers have been doing their thing in parts of Europe since at least the 11th century (in fact, the oldest continuously operating brewery in the world is a German establishment known as Brauerei Weihenstephan). But, some efforts in the US have actually led to the resurrection of styles of beer that were lost to history—such as porter, which disappeared entirely (no pun intended, for those true beer geeks out there (ok, we’ll clue you in: porter was once known as “entire”). Gotta love the beer geek humor!). It’s true—back in the 1970s, porter had vanished, only to be revived during the craft brew movement. And styles of ancient brew, like mead (honey beer) are now available in a variety of places in the US. Truly, there can be no doubting the contagiousness of microbrewed beer through the country—for that matter—across the continent. But, what about our southerly neghbors? Well, truth be told, the craze has yet to really take hold. While there are some true brew craftspeople in South America, pilsner beer (or the cheap, adjunct version of it) is still king. Hey, let’s not kid ourselves—the same is true in the states, sadly. But thanks to a handful of truly dedicated brewers, better beer is getting noticed down there. Take the folks at Cervejaria Sudbrack, brewing quality ales & lagers in accordance with traditions of European masters. Their true-to-style beers so closely emulate the greats of Britain, Belgium and German beers, you’d be shocked to discover they came out of Brazil. But, interestingly, the region of Blumenau, in which they make their home, is no stranger to European tradition. Beginning with the Portuguese Azors, who colonized the land many centuries ago, European traditions were brought to this region of South America. These early settlers certainly left their mark (just check out the brewery’s website (listed below)—it’s in Portuguese, the national language of Brazil). Immigrants from the heartland of beer-culture, Germany, also took up residence here in the 1800s when they colonized the region. They too left their mark; Blumenau, in the province of Santa Catarina, Brazil, where the brewery is located, is home to the world’s second largest Oktoberfest (outside of Munich that is). Despite the beer-loving roots firmly planted here some 200 years ago, craft-brewed beer is difficult to find. As the co-founder of Cervejaria Sudbrack, Juliano Mendes puts it, “[Brazil is] twenty-five years behind where the United States is today. The US has already created a relatively large group of interested and educated consumers of craft beer. In Brazil, we are only the beginning of the ‘craft beer revolution and we have a lot of work in front of us in order to create this type of ‘craft beer culture’”. To hammer home the point, consider this: today, craft brewers in Brazil hold about 0.05% of the market (the figure hovers around 4% in the US, and 8-fold difference). While studying in Boston, and taking inspiration from the craft brewed beers made by Samuel Adams (Boston Beer Company), Juliano and his brother decided that they’d return to Brazil and start a brewery. In 2002, Juliano, his brother, father and a fellow associate founded Cervejaria Sudbrack. 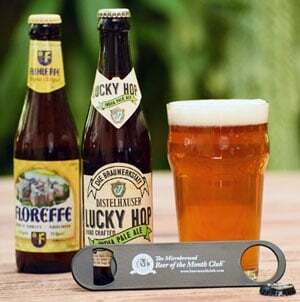 Aided in no small part by a contracted brewing engineer who was educated in Berlin, and their brewmaster who studied at the legendary Brauerei Weihenstephan (mentioned above), the brewery has developed full-bodied, character-loaded brews that are quickly garnering critical acclaim. Last month we got a chance to feature a beer indigenous to South America by shipping you XINGU, a native South American style black beer. While reviewing South American beers a few months ago, we had the chance to evaluate quite a few, and were very pleasantly surprised when we tasted those made by Juliano Mendes & company. In fact, we’ve got our eyes on these folks, as their beers are really world class in a country where top-notch, craft-brewed beers are difficult to come by. We were floored by how well made their beers are, not to mention how true to style their Belgian- and German-inspired beers are. For more (Portuguese) information about the brewery, visit www.eisenbahn.com.br.